Disneyland's Sleeping Beauty Castle will get an eye-catching but temporary throwback look thanks to some enormous 1950s artwork while the Anaheim theme park's iconic centerpiece undergoes a major renovation. Disneyland plans to wrap the front of Sleeping Beauty Castle in a massive rendering of early concept art of the castle predating the 1955 opening of the park. The back of the castle will be wrapped in an equally-huge animation still from the original "Sleeping Beauty" film. The decorative scrims, expected to be installed in early February, will cover the construction scaffolding surrounding the castle during the months-long renovation work, according to Disney officials. The extensive castle makeover will last until spring with no reopening date set. The work includes a $300,000 reroofing of the 70-foot-tall castle that will replace the fiber-reinforced plastic on the turrets. The castle renovation is part of a park-wide Project Stardust initiative designed to get Disneyland ready for its closeup ahead of the grand opening of Star Wars: Galaxy's Edge in June. 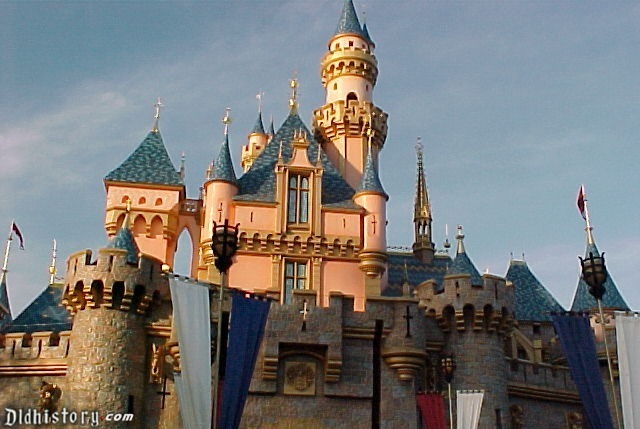 The decorative scrim on the front of the castle will replicate a 1954 concept illustration of the castle created by Disney artist Herbert Ryman, said Disneyland art director Kim Irvine. Ryman is best-known for drawing the original concept map of Disneyland over a single weekend in 1953 as Walt Disney sat beside him and described his dream for the park. The Disney Legend was instrumental in the look of Disneyland and continued to work on new Disney theme parks throughout his career. The scaffolding on the back of the castle will be covered with an image of Prince Phillip on horseback battling the Maleficent dragon amid thorns and flames. The massive Maleficent illustration will be based on an animation still from the 1959 "Sleeping Beauty" film, said Irvine, the art director for Walt Disney Imagineering's Disneyland office. Disney studio animators were working on the film while the boss was planning and building his first theme park in Anaheim. Ryman famously turned around a scale model of the castle to the delight of Disney, repositioning the front of the castle toward the back as visitors see it today.